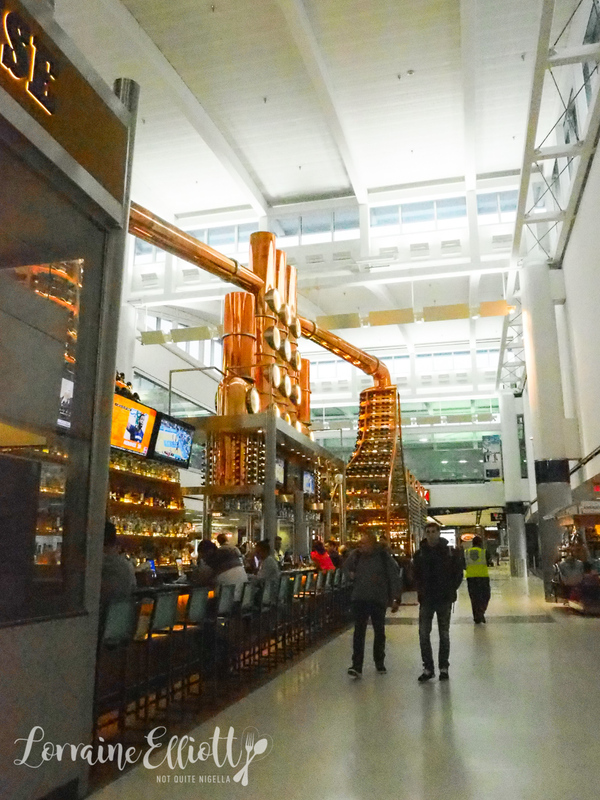 Airports vary widely and can be ordinary, underwhelming or behind the times. 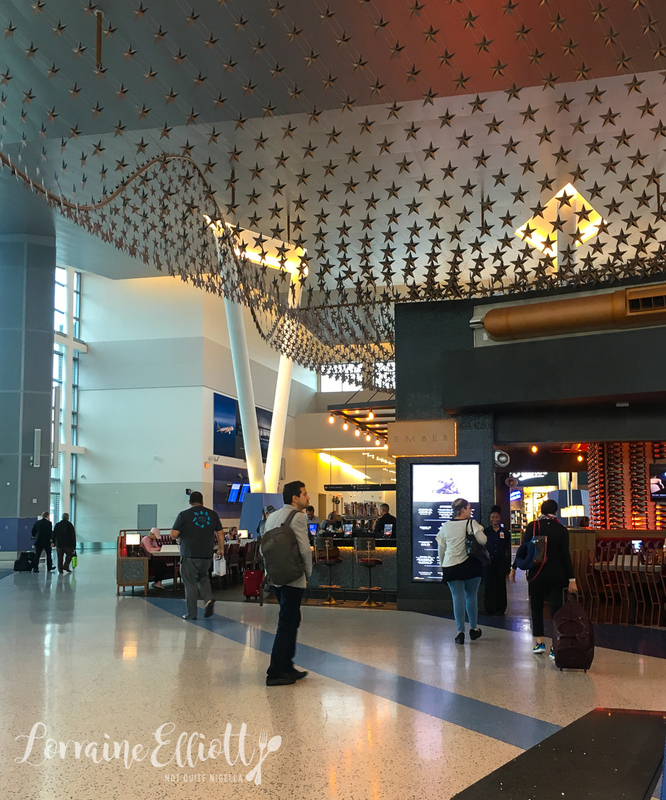 But the brand new wing at Terminal C North at George Bush International airport is set to challenge all those preconceptions. At a cost of $277M USD and spanning 265,000-square-feet, we take a look to see what it is like. 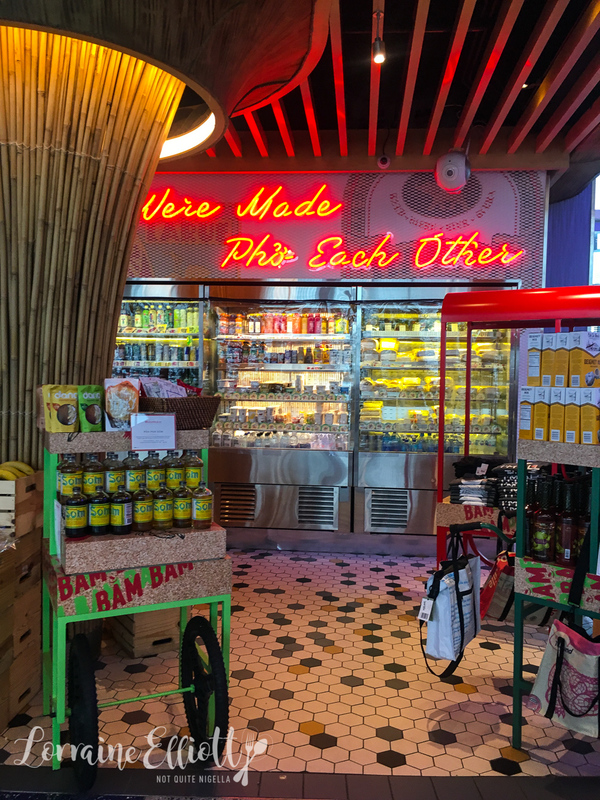 There are a total of 5 Houston chefs that have offerings at the new Terminal C North. 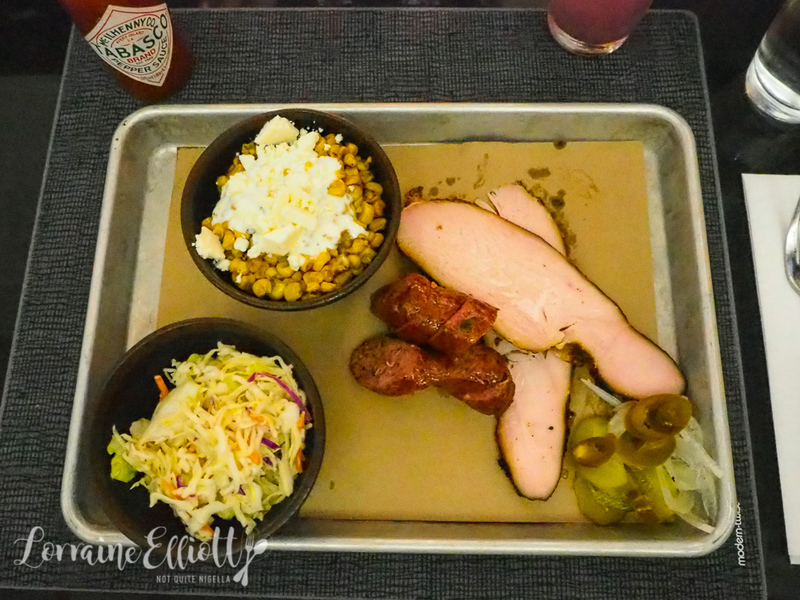 Embers is a wood fired grill by Chef Chris Shepherd while Bam Bam is a Vietnamese Cajun restaurant by Chef John Nguyen with a beer garden. Vida Taqueria by Chef Roland Laurenzo serves Tex Mex food while James Beard nominee Chef Monica Pope has a panini bar Olio. And if you just want a pizza there is Pala by chef Ryan Pera. 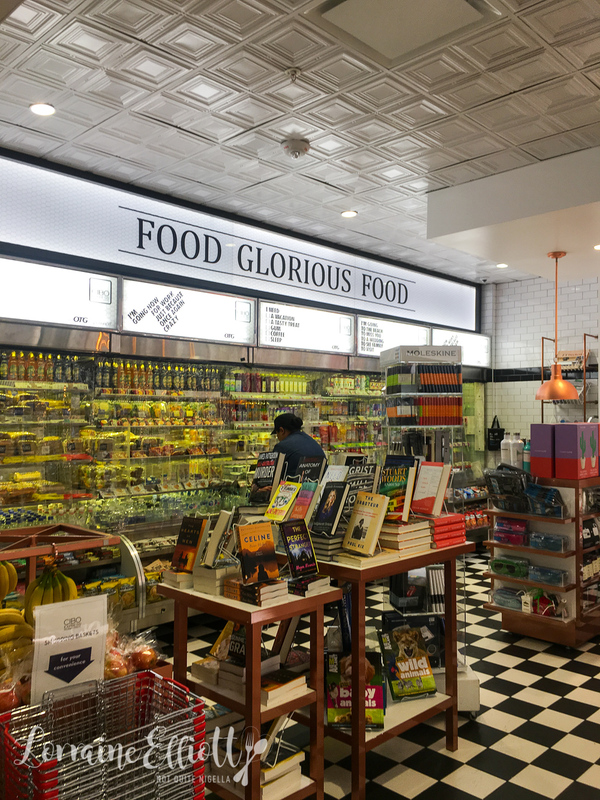 OTG who oversees all the culinary offerings at the airport is a tech heavy company and apparently has the largest number of iPads outside of Apple. In just Houston airport there are 8,000 iPads. 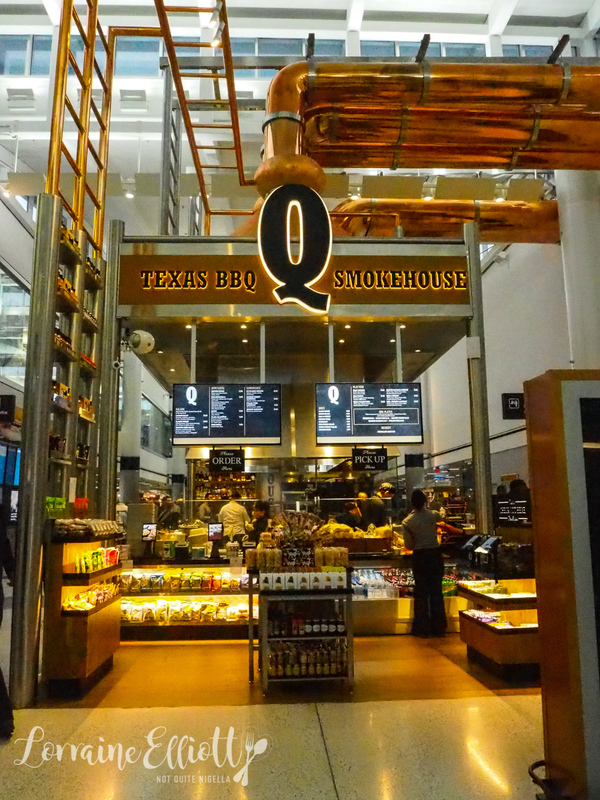 If you haven't had time to enjoy barbecue in Texas you can do so at Q Texas BBQ Smokehouse by Chef Greg Gatlin located at Terminal E, a five minute walk away from Terminal C.
It's hard to miss the enormous copper steampunk restaurant and the two smokers that smoke meat on the premises. You can take a seat at a table or bar and scan your boarding pass in and they will give you an update on your flight status. You can also pay for your food using United flight miles or USD. We are trying a few of their dishes so the sizes in the pictures don't reflect the actual portion sizes. I will say that the beef brisket doesn't melt in the same way as it did at Terry Black's. I recommend saving room for the juicy pork ribs or chopped pork or the jalapeno pork sausage. The Tejas (Mexican for Texas) Jalapenos are also definitely worth ordering. 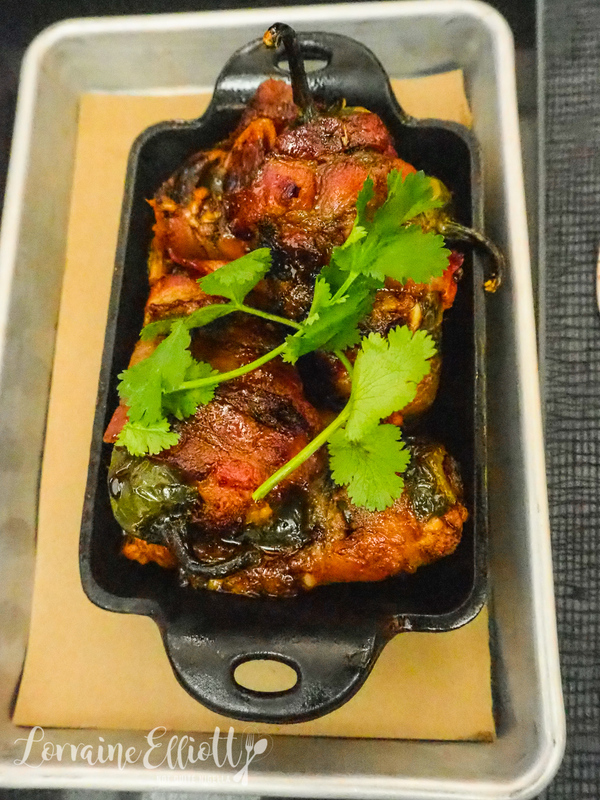 They are large roasted jalapenos stuffed with pulled pork, then wrapped in bacon and then finished with a sweet Dr Pepper glaze. They're an addictive sweet and spicy combination and it's hard to stop at one bite. In terms of sides, the mac and cheese and the beans are very good. I did ask for a recipe for the beans but they couldn't give them out only saying that they was red pepper chilli flakes, brisket, pinto beans, brown sugar and ketchup in the beans. I liked the beans so much I developed a Texas beans recipe once I got home that I think tastes very similar. We also all adored the sweet roasted corn topped with cotija cheese. 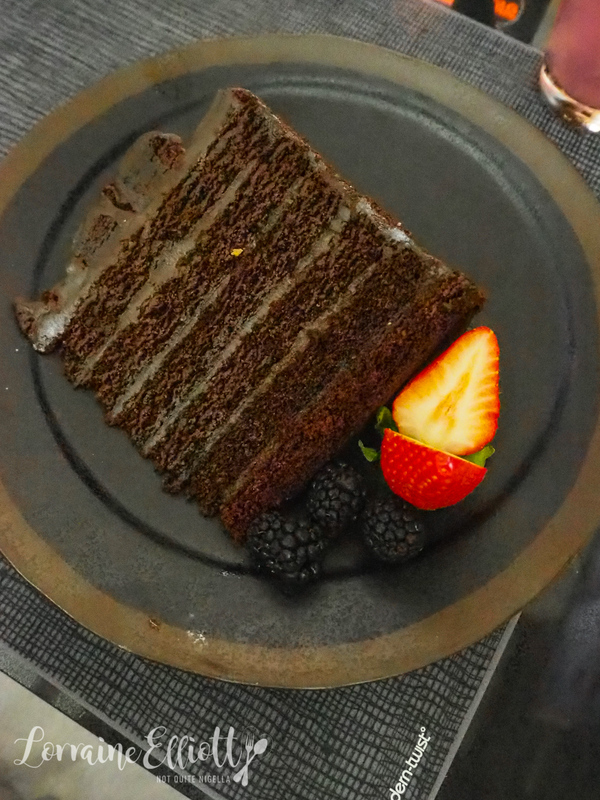 And if you want to finish on a bang, try their six layer chocolate cake. There's a thick layer of ganache frosting and the cake itself is very light but chocolatey rich. 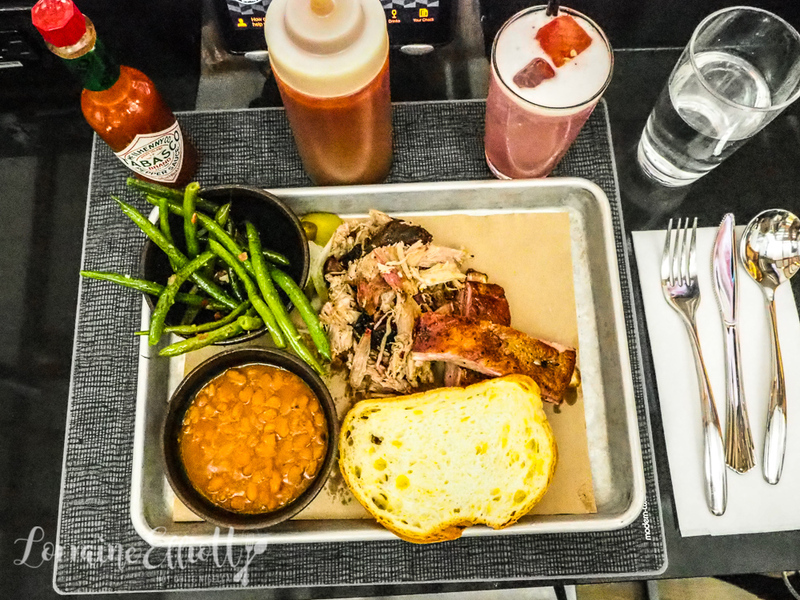 If you happen to be sitting in another area of the airport the smokehouse will also deliver to you. All you need to do is order via one of the airport's iPads and it will be delivered to wherever you are sitting. 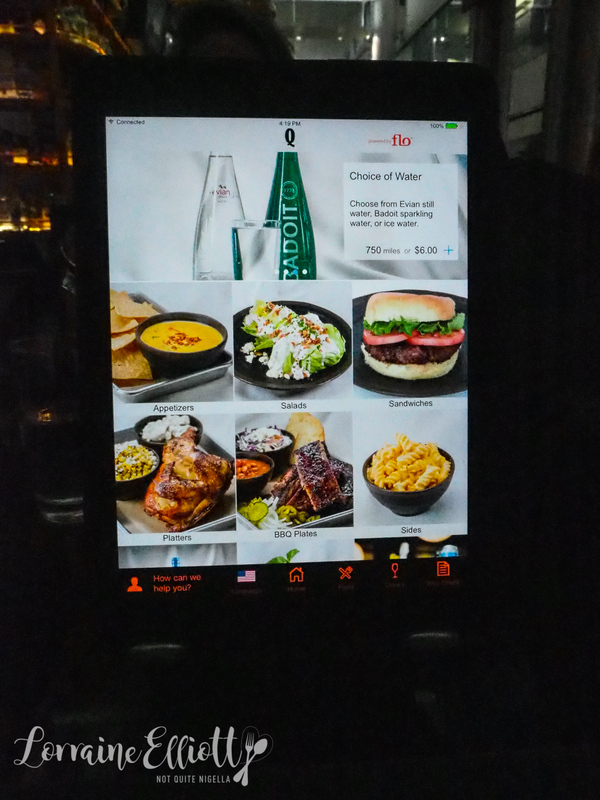 They tell us that you can order a $79USD Tomahawak steak and wine and put on your headphones and it will be delivered to your seat. If you've forgotten gifts the CIBO express has a great range of edible souveniers including cricket corn chips (every chip contains one cricket and they're really good and not weird! ), jalapeno aioli, jams, Bloody Mary kits and black truffle almonds. There are some things that are missing from this terminal though. There are no showers in the United lounge or outside which, if you're about to embark on an evening 17 hour flight to Australia you might just want. 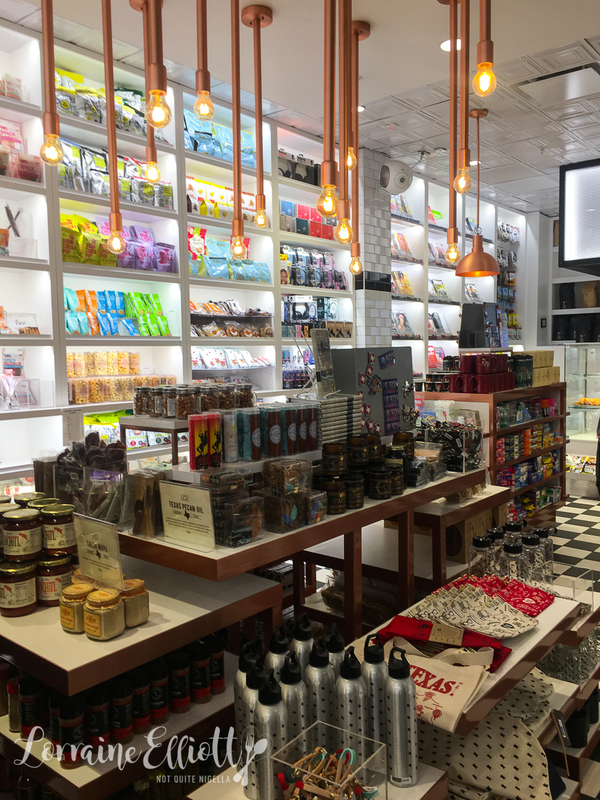 Also unlike Australia where you can get tax back at the airport for purchases over a certain amount if you are travelling overseas, it isn't so easy here and straightforward. In fact it's downright confusing. I recommend that you get your tax back at the point at which you purchased it rather than waiting to do it at the airport. So tell me Dear Reader, which is your favourite airport? How much ahead of time do you arrive for an International flight? 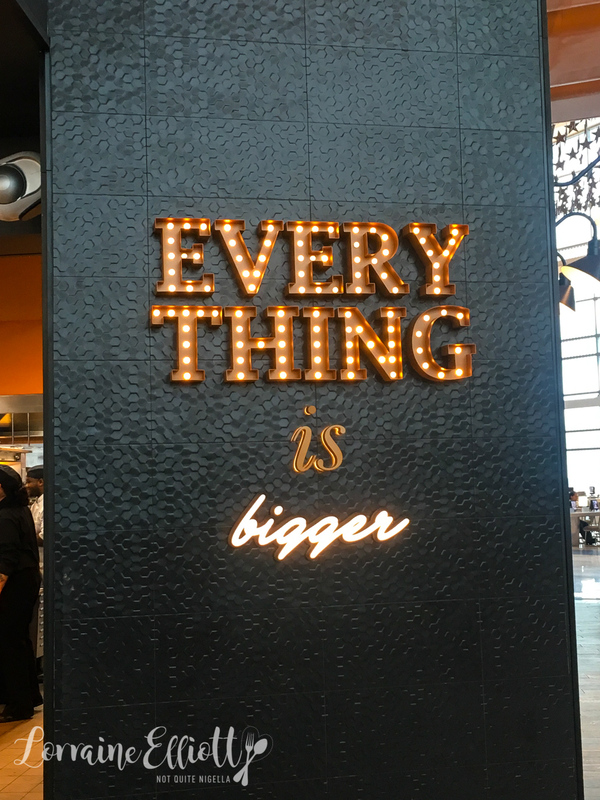 NQN explored Houston Airport as a guest of OTG but all opinions remain her own.